Browse Sabian | Musical Instruments | GAK. Sabian was founded in late 1981, when one of the world's greatest names in cymbal making, Robert Zildjian decided that drummers deserved better cymbals. Not happy with the quality, sound and relevance of cymbals made at that time, he launched Sabian. Located in the small eastern Canadian village of Meductic, New Brunswick, Sabian - most notably The Vault, where cymbals are designed - has since become the global centre for cymbal and sound innovation resulting in an unprecedented level of choice from the most diverse offering of cymbal design available. 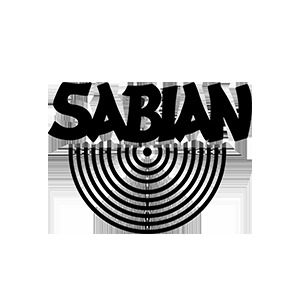 Here at GAK, we are proud to be a main Sabian dealer, stocking a huge collection of Sabian cymbal products including crash, ride, china, hi-hat, crash/ride and FX cymbals, as well as full cymbal box sets. Cymbals range from the 'SBr Series' perfect for those just starting out, through to the high-end 'Artisan Series'. If you have any inquiries regarding Sabian, please don't hesitate in contacting one of our specialists in store by calling 01273 665 400. Bringing back the vintage bright sounds from the 50s, 60s and 70s. This power pack of cymbals has been "Sonically Matched" as a set, so you can be assured they play and sound great together. Explosive new model developed with Chad Smith. A violent sound... loud and aggressive, with extreme attack. Versatility, versatility, versatility. Hit it hard for a modern sound, or play it with dynamics for controlled stick and sublime shimmer. Big, bold and explosive Crash. Delivers a combination of musicality and energy for sounds that are bright, bold, and explosive. Crisp stroke definition with a smooth blend of bright tones and a clean bell. The ideal balance of frequency and cut along with bright, extreme wash.
An impactful, moody cymbal, it creates a definite presence in any music. Deliver speedy attack and articulate response at all levels. A punchy, cutting splash that really opens up and breathes. Raw bell design with AAX hammering and lathing delivers plenty of substance and depth.